The new Macbook Pro 13" with Touch Bar has markedly different internals from its non-Touch Bar brother, including changes that make it horribly difficult to repair. iFixit, a company known for tearing into the latest computers and electronics to see what makes them tick, recently posted a teardown of the Macbook Pro 13” with Touch Bar. Although externally similar to the non-Touch Bar model, the Touch Bar enabled Macbook Pro showed some stark differences internally. Some components are harder (or even impossible) to replace. Both 13” Macbook Pros have the exact same dimensions, similar trackpads, and similar keyboards (save for the Touch Bar that replaces the top row function keys on the higher-end device). The Touch Bar enabled Macbook Pro is 20 grams lighter (probably due to a smaller battery) and includes additional ventilation on the sides of the chassis. It also includes two additional Thunderbolt 3 USB Type-C ports on the right side. 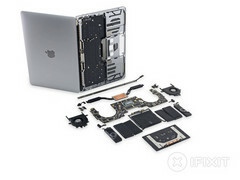 iFixit compared the new model to their teardown of the lower-end Macbook Pro. Internally, the Touch Bar model has a redesigned logic board, an additional fan, and a larger heat sink array. It also has a much smaller battery. Most notably, the SSD for the Touch Bar Macbook Pro is soldered onto the logic board. The non-Touch Bar model has a removable SSD, allowing end users to upgrade or replace the storage. Users of the Touch Bar version have no such luck. As such, customers will need to configure the notebook with enough storage upon purchase as they’ll be stuck with whatever capacity they buy. Interestingly, the speakers inside the chassis don’t line up with the speaker grilles. Instead, the sound comes out through the side air vents, which means the speaker grilles are most likely a cosmetic design choice. Overall, the device is not very repairable. Due to the specialized screws, copious amounts of adhesive, and difficult to reach parts, iFixit gave the 13” Macbook Pro with Touch Bar a 1 out of 10 for repairability, which makes it one of the most difficult to repair items they’ve reviewed. The full teardown can be found here.